Mitochondria are cytosolic organelles essential for generating energy and maintaining cell homeostasis. Despite their critical function, the handful of proteins expressed by the mitochondrial genome is insufficient to maintain mitochondrial structure or activity. Accordingly, mitochondrial metabolism is fully dependent on factors encoded by the nuclear DNA, including many proteins synthesized in the cytosol and imported into mitochondria via established mechanisms. However, there is growing evidence that mammalian mitochondria can also import cytosolic noncoding RNA via poorly understood processes. Here, we summarize our knowledge of mitochondrial RNA, discuss recent progress in understanding the molecular mechanisms and functional impact of RNA import into mitochondria, and identify rising challenges and opportunities in this rapidly evolving field. As a primary site for energy generation, calcium signaling, and apoptotic factors, mitochondria are essential multifunctional organelles in eukaryotic cells. Derived from endosymbiotic bacterial ancestors, eukaryotic mitochondria have their own genome and are equipped with fully functional gene expression machineries (1, 2). To maintain their biogenesis and function, however, mitochondria require a large number of proteins that are encoded by the nuclear genome, translated in the cytosol, and subsequently imported into mitochondria. Accordingly, there has been a strong effort to elucidate the mechanisms of protein import into mitochondria (3–5). Since the first discovery of cytosolic transfer RNAs (tRNAs) in mitochondria 50 years ago (6), evidence has accumulated supporting the notion that many types of RNA transcribed from nuclear DNA are actively delivered to mitochondria. Imported RNAs include different types of noncoding (nc)RNAs, such as tRNAs, 5S rRNA, MRP RNA (RMRP), and RNase P RNA (RPPH1) (7–13), as well as microRNAs (mitomiRs) (14, 15). Their mobilization into mitochondria requires a range of protein factors (16–19), although the mechanisms that select and import RNAs into mitochondria, as well as the impact of imported RNAs on mitochondrial gene expression programs are largely unknown. The mammalian mitochondrial genome (~12,500 bp) encodes 13 proteins, 22 tRNAs, and two ribosomal RNAs, 12S rRNA and 16S rRNA, which assemble the small (28S) and large (39S) subunits of the 55S mitochondrial ribosome (20). The mammalian mitochondrial DNA is transcribed as polycistronic precursor RNAs synthesized from both strands, the heavy (H) and the light (L) strands. The individual mitochondrial (mt-) rRNA and mt-mRNA sequences are regularly interspersed with mt-tRNA genes (21). The 13 proteins encoded by the mitochondrial genome function in the oxidative phosphorylation (OX-PHOS) complex (21, 22). Recently, two different laboratories reported whole-transcriptome analyses of purified human mitochondria and mitoplasts (23, 24). The studies identified numerous small RNAs and long noncoding RNAs (lncRNAs) transcribed from the mitochondrial genome. Among them, the lncRNAs lncND5, lncND6, and lncCyt b were identified as the counterpart antisense transcripts of the mitochondrial ND5, ND6, and CYTB mRNAs, respectively (23). lncND5 and lncCyt b were transcribed from the L strand, and lncND6 from the H strand of the mitochondrial DNA. Intriguingly, one of the known mitochondrial RNA processing proteins, the mitochondrial RNase P protein 1 (MRPP1) (25), was proposed to have a unique RNA processing function, influencing the maturation and abundance of lncRNA transcripts (24) (Table 1). Villegas et al. reported a human mitochondrial chimeric transcript called sense noncoding mitochondria ribosomal RNA (SncmtRNA) (26), structurally similar to a mouse mitochondrial RNA, containing a loop structure and a long inverted repeat (IR) linked to the 5′ end of the sense mitochondrial 16S rRNA (27). Interestingly, SncmtRNA was only detected in proliferating cells but not in resting cells, suggesting that it might be a marker of cell proliferation (26). Two other ncRNAs that formed a similar chimeric structure with SncmtRNA but containing the antisense fragment of 16S rRNA transcribed from the L-strand were later identified (ASncmtRNA1 and ASncmtRNA2) (28). Unlike the SncmtRNA, which is abundant in normal and cancerous proliferating cells, ASncmtRNA1 and ASncmtRNA2 were found expressed only in normal cells and were much less abundant in tumor cells (26, 28). A striking subsequent report found that both SncmtRNA and ASncmtRNAs were found in the nucleus associated with heterochromatin, suggesting the possibility that these mitochondrial lncRNAs participate in intraorganellar communication via retrograde signaling pathways (29). Recently, the ASncmtRNA2 was found upregulated in senescent cells, where ASncmtRNA2 delayed cell cycle progression through the G2/M cell cycle phases, possibly through the action of two microRNAs (hsa-miR4485 and hsa-miR1973) derived from ASncmtRNA2 (30) (Table 1, Fig. 1). Very recently, a novel mitochondrial DNA-encoded lncRNA, LIPCAR (long intergenic noncoding RNA predicting cardiac remodeling) was identified in plasma of patients with left ventricular (LV) remodeling post-myocardial infarction (MI). LIPCAR levels declined in early stages after myocardial infarction, but increased in late stages, coinciding with LV remodeling. Increased levels of LIPCAR identified patients at high risk of heart failure or death, suggesting that LIPCAR was a possible biomarker for cardiac remodeling in patients who had an episode of acute MI (31) (Table 1, Fig. 1). Although mitochondria synthesize dozens of RNAs from their own mitochondrial DNA, some nuclear DNA-encoded RNAs can be mobilized into mitochondria. As mentioned above, the import mechanism of cytoplasmic proteins into mitochondria has been studied in detail, but the mechanisms that import nuclear DNA-encoded RNAs into mitochondria are far less clear (32). Only a few noncoding transcripts are selectively transported into the mitochondrial matrix (17, 24). In this section, we discuss the current knowledge of the major mitochondria-localized ncRNAs: tRNA, 5S rRNA (9, 11), MRP RNA (RMRP) (33), RNase P RNA (RPPH1) (12), and microRNAs (mitomiRs) (14, 15). The presence of nuclear DNA-encoded tRNAs in mitochondria was first suggested decades ago from a survey of the protozoan Tetrahymena (6). A following study in yeast S. cerevisiae also found that one of two mitochondrial tRNAs (isoacceptors of tRNALys) originated from the nuclear DNA (34). Since this time, the traffic of nuclear DNA-encoded tRNAs to mitochondria has been observed in many organisms, including protozoa (35–40), yeast (41, 42), plants (43–48), and mammals (49). We now recognize that in most organisms at least a few cytosolic tRNA species are required for maintaining mitochondrial biogenesis (50, 51). Moreover, a cytoplasmic tRNA from yeast (tRNALys; tRNALys acceptor 1, tRK1) was found to be internalized into human mitochondria (32, 52), suggesting that yeast and human mitochondria might share key components of RNA import (53). Mitochondrial tRNA import occurs in higher organisms including human, even though mitochondrial DNA already encodes a full set of tRNAs required for the mitochondrial translation (52, 54, 55). The protein factors responsible for targeting the yeast tRNA tRK1 to mitochondria include the glycolytic enzyme enolase (ENO2P), which binds tRK1 to form a complex that is directed to the mitochondrial surface, whereupon the tRNA is handed over to the precursor of the mitochondrial lysyl-tRNA synthetase (preMSK or pre-LysRS) (56–58). The resulting complex tRNA-pre-LysRS is then internalized into the mitochondrial matrix through the protein import pathway, comprising the translocase of the translocase of the outer (TOM) and inner (TIM) mitochondrial membrane (the TOM/TIM complex) (59, 60). A recent study investigating the conformational change of the labeled tRNALys (tRK1) suggested that tRNA alters its structure upon binding to each carrier protein (ENO2P and pre-LysRS) of the import pathway (61). Both tRK1 and an artificial RNA containing the structural elements required for tRK1 mitochondrial import were targeted into human mitochondria with assistance by the cytosolic precursor of human mitochondrial lysyl-tRNA synthetase (pre-KARS2) and mammalian ENO2 (62). However, it is still unclear how tRNA and pre-LysRS remain bound during translocation through the the TOM and TIM complexes (63, 64), despite indications that the mitochondrial protein import machinery might accommodate proteins conjugated with RNAs (65) (Fig. 1). Ancestral mitochondria were believed to have a complete set of rRNAs, but most mitochondrial rRNAs, including 5S rRNA, were lost during evolution (66). Two proteins were found to regulate the intracellular distribution and ribosomal assembly of 5S rRNA: the transcription factor TFIIIA, which binds to 5S rRNA and mediates the nuclear export of 5S rRNA and its ribosomal integration in X. laevis oocytes (67, 68), and the ribosomal protein L5, which forms the RNP complex 5S rRNA-L5 (69), essential for delivering 5S rRNA to the cytoplasm and assembling it into ribosomes (70, 71) (Fig. 1). Other studies showed that a substantial portion of nuclear DNA-encoded 5S rRNA is directed to mammalian mitochondria (9, 11). Entelis et al. proposed that cytosolic 5S rRNA imported into mitochondria might substitute for its missing counterpart and form a functional mitochondrial ribosome (mitoribosome) large subunit (LSU) (32). Several proteins regulating 5S rRNA import into mitochondria, as well as key 5S rRNA motifs (helix I and helix IV-loop D) have been identified in recent years (72). For example, the mitochondrial enzyme Rhodanese bound the helix I sequence of 5S rRNA and enhanced 5S rRNA import, while Rhodanese depletion abolished 5S rRNA import into mitochondria and decreased global mitochondrial translation, suggesting that the Rhodanese-driven localization of 5S rRNA enhances mitochondrial function (73) (Fig. 1). Human MRP (mitochondrial ribosomal protein)-L18 was identified as another 5S rRNA import factor. As observed for Rhodanese, the import sequence of 5S rRNA directly interacted with mature MRP-L18 but also with its precursor, preMRP-L18, which contains a mitochondria-targeting sequence in its N-terminal region. The interaction between preMRP-L18 and 5S rRNA in the cytosol causes a conformational change in 5S rRNA that makes it recognized by Rhodanese and translocated into mitochondria. In the matrix, the innermost space in mitochondria, 5S rRNA was proposed to associate with the mature MRP-L18 and with mitoribosomes, affecting mitochondrial translation efficiency (18) (Fig. 1). The 267-nt long lncRNA RMRP is an RNA component of the mitochondrial RNA-processing endoribonuclease complex (RNase MRP), and its mutation causes the pleiotropic human disease cartilage-hair hypoplasia (CHH) (74). RMRP is broadly expressed in mouse and human tissues from an intronless nuclear gene (75), and resides in the nucleus and mitochondria. In the nucleus, RMRP is involved in the 5′end maturation of 5.8S rRNA (76, 77) and influences yeast cell division cycle by binding the 5′untranslated region (UTR) of B-cyclin (CLB2) mRNA and degrading CLB2 mRNA during mitosis (78). Human telomerase reverse transcriptase (hTERT) also associated with RMRP and synthesized a double-stranded RNA (dsRMRP) that was recognized by the endoribonuclease DICER1 and processed into short interfering (si) RNA (79). There is strong evidence that RMRP is also found in mammalian mitochondria (17, 19, 23). The Clayton laboratory further proposed that RMRP was involved in mitochondrial RNA processing as well as in mitochondrial DNA replication (7, 8), although these functions are not fully understood. PNPASE (polynucleotide phosphorylase or 3′-to-5′ exoribonuclease and poly(A) polymerase) is a nuclear DNA-encoded protein that can be localized in the mitochondrial intermembrane space (IMS) (80–82). Recently, Wang et al. identified a novel function for mitochondrial PNPASE in regulating the import into the mitochondrial matrix of RNAs transcribed in the nucleus. Besides its impact on mitochondrial RNA processing, translation, and respiration, PNPASE can internalize RNAs including RMRP, 5S rRNA, and RNase P RNA (RPPH1, described in the next section) from the IMS into the matrix. Interestingly, both RMRP and RPPH1 were shown to share a stem loop structure recognized by PNPASE, which is critical for their translocation (17) (Table 1, Fig. 1). Very recently, Noh et al. proposed a molecular mechanism whereby RBPs contributed to the intracellular and the suborganelle-specific distribution of lncRNP complexes. Their findings revealed that RMRP is exported from the nucleus to the cytosol by the RBP HuR through a CRM1 (chromosome region maintenance 1)-dependent nuclear export pathway. The exported RMRP was targeted into the mitochondrial matrix through unknown mechanisms, but once in the matrix, a nuclear DNA-encoded, mitochondria-resident RBP, GRSF1 (G-rich RNA sequence-binding factor 1), interacted with the imported RMRP and the resulting lncRNP complex was proposed to contribute to mitochondrial function by affecting the OX-PHOS system and mitochondrial DNA replication (19) (Table 1, Fig. 1). RNase P RNA from bacteria, archaea, and eukarya was initially characterized as a catalytic subunit of a ribozyme capable of removing the 5′ leader sequence from tRNA precursors in the absence of protein subunits (83–85). An endoribonuclease protein complex that cleaves the E. coli tRNATyr at the same site as bacterial RNase P was partially purified from mammalian mitochondria and was named mtRNase P, to distinguish it from its nuclear counterpart (nuRNase P) (86). Subsequent studies found that unlike mammalian nuRNase P and bacterial RNase P, which include an RNA component, mammalian mtRNase P does not (13, 87); however, other studies found an RNA similar to the H1 RNA of nuRNase P bound to mammalian mtRNase P (12, 88). Despite controversy about its function, there is strong evidence that RNase P RNA is imported into the mitochondrial matrix (17, 19, 23) (Table 1, Fig. 1). MicroRNAs (miRNAs) are small noncoding RNA molecules (~22 nucleotides long) that generally target and suppress mRNA stability and/or translation (89, 90). They are transcribed as primary (pri-)microRNAs, which are processed in the nucleus by the DROSHA/DGCR8 complex into precursor (pre-)microRNAs that are exported to the cytoplasm and further processed by DICER1 into mature microRNAs. MicroRNAs associated with the RBP AGO2 (argonaute 2), a component of the RNA-induced silencing complex (RISC), are directed to target mRNAs with which they share partial sequence complementarity (91–94). MicroRNAs can potentially interact with a wide range of target mRNAs and thus have emerged as potent posttranscriptional regulators involved in several cellular processes, including survival, death, division, differentiation, and senescence (95–101). In turn, they impact upon physiologic processes and diseases, such as cancer, cardiovascular disease, neurodegeneration, aging, inflammation, and diabetes (101–103). The recent discovery of microRNAs in mitochondria has expanded the spectrum of possible posttranscriptional functions of microRNAs and has led to a search for mechanisms of microRNA translocation to mitochondria. In this section, we review some of these microRNAs and their impact on mitochondrial functions. Generally, microRNAs function as the sequence specificity-conferring component of the RISC, which suppresses the stability and/or translation of target mRNAs in the cytosol. The RISC includes multiple RBPs such as AGO, TRBP1, TRBP2, and GW182. Accumulating evidence indicates that microRNAs and AGO2 exist in mitochondria (14, 15, 104), although the mechanisms through which microRNAs are imported into mitochondria as well as their functional impact are largely unknown. Pre-microRNAs have also been detected in mitochondria, suggesting that some aspects of microRNA biogenesis may occur in mitochondria (105–107). Moreover, the discovery of AGO2-bound microRNAs in mitochondria suggests that AGO2 may be important for the import of microRNAs into mitochondria possibly via co-import (108); interestingly, there is no evidence that other AGO proteins (e.g., AGO1 and AGO3) are imported to mitochondria (109). Crosslinking and immunoprecipitation (CLIP)-based analyses have further shown that AGO2 is associated with mitochondrial DNA-encoded transcripts (104). At present, the full mechanisms that govern these translocation events are not known. The vast majority of microRNAs found in mitochondria, collectively known as mitomiRs (110), are encoded by nuclear DNA, although a few microRNAs (specifically, miR-1974, miR-1977, and miR-1978) are encoded by mitochondrial DNA (14). Although the functions of most mitomiRs are unknown, they have been suggested to play roles in cell survival, cell division, and energy metabolism, as well as in disease processes like cancer (111). Among the few mitomiRs that have been studied functionally, the nuclear DNA-encoded miR-181c was found to translocate into mitochondria and to regulate mitochondrial gene expression. In rodents, overexpression of miR-181c, which targeted and downregulated mt-COX1 (cytochrome c oxidase subunit 1) mRNA, led to higher ROS production, lower exercise capacity, and the appearance of cardiac dysfunction (112). Interestingly, the translocation of miR-1 into mitochondria with AGO2 led to increased translation of COX1 and the mitochondrial DNA-encoded NADH dehydrogenase 1 (ND1), suggesting that miR-1 coordinates gene expression networks in the cytoplasm and the mitochondria during muscle differentiation (109). Next-generation sequencing (NGS) identified several microRNAs imported into mitochondria in 206 ρ° cells, such as miR-181c-5p and miR-146a-5p, which had many potential targets within the mitochondria, including RNAs transcribed from nuclear DNA and from mitochondrial DNA (112, 113). The mitochondria-localized miR-34a was recently found to control the integrity of the blood-brain barrier in cultured cerebrovascular endothelial cells by lowering mitochondrial oxidative phosphorylation and the levels of adenosine triphosphate and cytochrome c (114). However, miR-34a was also detected in the cytosol and thus its effect on the integrity of the blood-brain barrier might include miR-34a actions on cytosolic mRNAs. In a mouse model of diabetic heart and in HL-1 cells, Jagannathan et al. identified a pool of mitomiRs including miR-378, which translocated into mitochondria following a diabetic insult and downregulated the mitochondrially encoded F0 component ATP6, essential for cardiac pump function (115). Together, these studies provide evidence that a substantial portion of microRNAs are imported into mitochondria and may influence mitochondrial gene expression programs widely. MitomiRs can enhance and reduce the expression of mRNAs originated from mitochondrial and nuclear transcription and in turn affect mitochondrial metabolic activity and cell homeostasis. It will be important to elucidate the mechanisms that govern microRNA localization in mitochondria, including the transport and interaction factors (e.g., RBPs and long noncoding RNAs), the mitochondria localization signals that tag microRNAs to mitochondria (e.g., RNA motifs), and the mitochondrial transport machineries that mediate such transport. In addition, it will be critical to identify the mitochondrial interaction partners (AGO2 and likely other RBPs) that enable the mitochondrial functions of mitomiRs. We have summarized our knowledge of noncoding RNAs mobilized into and out of mitochondria as well as their function. We discuss specific areas that warrant immediate attention as the field progresses. Recent advances in high-throughput sequencing technology have revealed vast numbers of lncRNAs expressed in cells (116) and follow-up studies have shown that they regulate gene expression programs transcriptionally, post-transcriptionally, and post-translationally (117–121). Indeed, most lncRNAs transcribed from nuclear DNA form lncRNA-protein complexes (lncRNPs) that are essential for their function in both the nucleus and the cytoplasm. We reviewed mitochondrial lncRNAs derived from the mitochondrial genome (lncND5, lncND6, lncCyt b, SncmtRNA, ASncmtRNA1/2, and LIPCAR) and the nuclear genome (tRNAs, 5S rRNA, MRP RNA, and RNase P RNA). For many lncRNAs examined in molecular detail, the interacting protein partners (RBPs) (122, 123) have been associated with their function. Future studies should examine whether specific RBPs associated with lncRNAs function as import/export factors. Besides specialized RBPs, there might be a basic machinery that controls RNA mobilization. This machinery employs ATP and appears to rely on factors located in the mitochondrial outer membrane (OM) as well as on core components of the protein import pathway, the TOM/TIM complex (60). An earlier study in yeast suggested that the yeast Tom20 and Tim44 complexes were involved in translocating the cytoplasmic tRNALys into mitochondria (59). VDAC (voltage-dependent anion channel), an abundant structural protein in the OM, appeared to contribute to mitochondrial tRNA import in plants (124). It will be important to test in the near future if VDAC and/or other OM-associated proteins can recognize and capture cytosolic RNAs at the surface of mammalian mitochondria. The mitochondrial ribosome (mitoribosome) has been identified in organisms from yeast to mammalian cells (125, 126), and was found to be poorly conserved in structure and composition among species. The mitoribosome is associated with the mitochondrial inner membrane, facing the matrix side, which enables it to insert highly hydrophobic nascent polypeptides easily upon translation (22, 127–130). Smirnov et al. proposed a model whereby the imported 5S rRNA associated with the mitoribosomal large subunit (LSU), affecting mitochondrial translation efficiency (18) and helping to explain the high abundance of 5S rRNAs found in mammalian mitochondria. However, a more recent study using cryo-EM provided alternative molecular evidence that mitoribosomal LSU has negligible or no 5S rRNA (131). Considering its vital roles for maintaining mitochondrial biogenesis and functions, the structural and functional RNA component of the mitoribosome also deserves in-depth investigation. Optimal mitochondrial activity is necessary for cell homeostasis. Accordingly, mitochondrial dysfunction has been linked to chronic neurodegenerative disorders including Alzheimer’s disease (AD), associated with the deposition of toxic Aβ peptide and DNA damage caused by defective base excision repair (132–134), and Parkinson’s disease, caused by genetic alterations of PINK1, Parkin, DJ-1, and α-Synuclein (135–138). In addition, increasing evidence suggests that mitochondrial dysfunction contributes to cardiovascular disease (139, 140), muscle atrophy (141), insulin resistance (142), chronic obstructive pulmonary disease (143), cancer cachexia (144), and neuromuscular disorders (145). Mitochondrial dysfunction associated with damage and mutations of the mitochondrial DNA has been linked to accelerated aging and age-related disease (146, 147). As previously hypothesized, mitochondria-directed RNA can be used as an endogenous vector that is effectively mobilized into mitochondria, carrying inserted heterologous sequences. Theoretically, it seems possible to introduce a particular RNA sequence which is complementary to the mutated region of mitochondrial DNA, thereby lowering the replication efficiency and clearing the ‘bad’ mitochondria from cells (148). In fact, interventions devised to eliminate pathogenic mitochondrial DNA, involving the creation of a chimeric RNA bearing a mitochondrial import signal and a sequence proximal to the mitochondrial DNA mutation site, were recently reported (149). These and other strategies are under consideration as we develop molecular and pharmacological methods to intervene in disease processes linked to aberrant mitochondrial function. Fig. 1. Schematic of the ncRNAs transported through the mitochondrial outer and inner membranes (OM, IM). 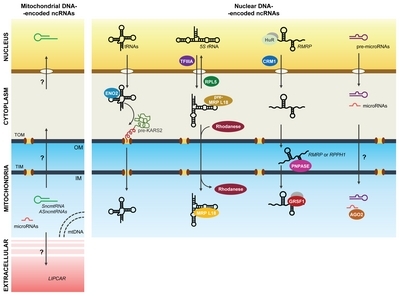 Left, ncRNAs synthesized in mitochondria but found elsewhere (nucleus and extracellular space); right, ncRNAs synthesized in the nucleus and found in mitochondria, including tRNAs, 5S rRNA, lncRNAs like RMRP, and microRNAs and their precursors. Transport factors identified as mediators of these processes, including many ncRNA-interacting RBPs, are indicated. Yellow, nucleus; gray, cytoplasm; blue, mitochondria; pink, extracellular space. Gray, MW, Burger, G, and Lang, BF (1999). Mitochondrial evolution. Science. 283, 1476-1481. Lane, N, and Martin, W (2010). The energetics of genome complexity. Nature. 467, 929-934. Neupert, W, and Herrmann, JM (2007). Translocation of proteins into mitochondria. Annu Rev Biochem. 76, 723-749. Chacinska, A, Koehler, CM, Milenkovic, D, Lithgow, T, and Pfanner, N (2009). Importing mitochondrial proteins: machineries and mechanisms. Cell. 138, 628-644. Schmidt, O, Pfanner, N, and Meisinger, C (2010). Mitochondrial protein import: from proteomics to functional mechanisms. Nat Rev Mol Cell Biol. 11, 655-667. Suyama, Y (1967). The origins of mitochondrial ribonucleic acids in Tetrahymena pyriformis. Biochemistry. 6, 2829-2839. Chang, DD, and Clayton, DA (1989). Mouse RNAase MRP RNA is encoded by a nuclear gene and contains a decamer sequence complementary to a conserved region of mitochondrial RNA substrate. Cell. 56, 131-139. Chang, DD, and Clayton, DA (1987). A mammalian mitochondrial RNA processing activity contains nucleus-encoded RNA. Science. 235, 1178-1184. Yoshionari, S, Koike, T, and Yokogawa, T (1994). Existence of nuclear-encoded 5S-rRNA in bovine mitochondria. FEBS Lett. 338, 137-142. Kiss, T, and Filipowicz, W (1992). Evidence against a mitochondrial location of the 7-2/MRP RNA in mammalian cells. Cell. 70, 11-16. Magalhaes, PJ, Andreu, AL, and Schon, EA (1998). Evidence for the presence of 5S rRNA in mammalian mitochondria. Mol Biol Cell. 9, 2375-2382. Puranam, RS, and Attardi, G (2001). The RNase P associated with HeLa cell mitochondria contains an essential RNA component identical in sequence to that of the nuclear RNase P. Mol Cell Biol. 21, 548-561. Holzmann, J, Frank, P, Loffler, E, Bennett, KL, Gerner, C, and Rossmanith, W (2008). RNase P without RNA: identification and functional reconstitution of the human mitochondrial tRNA processing enzyme. Cell. 135, 462-474. Bandiera, S, Ruberg, S, and Girard, M (2011). Nuclear outsourcing of RNA interference components to human mitochondria. PLoS One. 6, e20746. Sripada, L, Tomar, D, Prajapati, P, Singh, R, Singh, AK, and Singh, R (2012). Systematic analysis of small RNAs associated with human mitochondria by deep sequencing: detailed analysis of mitochondrial associated miRNA. PLoS One. 7, e44873. Kamenski, P, Kolesnikova, O, and Jubenot, V (2007). Evidence for an adaptation mechanism of mitochondrial translation via tRNA import from the cytosol. Mol Cell. 26, 625-637. Wang, G, Chen, HW, and Oktay, Y (2010). PNPASE regulates RNA import into mitochondria. Cell. 142, 456-467. Smirnov, A, Entelis, N, Martin, RP, and Tarassov, I (2011). Biological significance of 5S rRNA import into human mitochondria: role of ribosomal protein MRP-L18. Genes Dev. 25, 1289-1305. Noh, JH, Kim, KM, and Abdelmohsen, K (2016). HuR and GRSF1 modulate the nuclear export and mitochondrial localization of the lncRNA RMRP. Genes Dev. 30, 1224-1239. O’Brien, TW (2002). Evolution of a protein-rich mitochondrial ribosome: implications for human genetic disease. Gene. 286, 73-79. Ojala, D, Montoya, J, and Attardi, G (1981). tRNA punctuation model of RNA processing in human mitochondria. Nature. 290, 470-474. Attardi, G, and Ojala, D (1971). Mitochondrial ribssome in HeLa cells. Nat New Biol. 229, 133-136. Mercer, TR, Neph, S, and Dinger, ME (2011). The human mitochondrial transcriptome. Cell. 146, 645-658. Rackham, O, Shearwood, AM, Mercer, TR, Davies, SM, Mattick, JS, and Filipovska, A (2011). Long noncoding RNAs are generated from the mitochondrial genome and regulated by nuclear-encoded proteins. RNA. 17, 2085-2093. Sanchez, MI, Mercer, TR, and Davies, SM (2011). RNA processing in human mitochondria. Cell Cycle. 10, 2904-2916. Villegas, J, Burzio, V, and Villota, C (2007). Expression of a novel non-coding mitochondrial RNA in human proliferating cells. Nucleic Acids Res. 35, 7336-7347. Villegas, J, Zarraga, AM, and Muller, I (2000). A novel chimeric mitochondrial RNA localized in the nucleus of mouse sperm. DNA Cell Biol. 19, 579-588. Burzio, VA, Villota, C, and Villegas, J (2009). Expression of a family of noncoding mitochondrial RNAs distinguishes normal from cancer cells. Proc Natl Acad Sci U S A. 106, 9430-9434. Landerer, E, Villegas, J, and Burzio, VA (2011). Nuclear localization of the mitochondrial ncRNAs in normal and cancer cells. Cell Oncol (Dordr). 34, 297-305. Bianchessi, V, Badi, I, and Bertolotti, M (2015). The mitochondrial lncRNA ASncmtRNA-2 is induced in aging and replicative senescence in Endothelial Cells. J Mol Cell Cardiol. 81, 62-70. Kumarswamy, R, Bauters, C, and Volkmann, I (2014). Circulating long noncoding RNA, LIPCAR, predicts survival in patients with heart failure. Circ Res. 114, 1569-1575. Entelis, NS, Kolesnikova, OA, Dogan, S, Martin, RP, and Tarassov, IA (2001). 5 S rRNA and tRNA import into human mitochondria. Comparison of in vitro requirements. J Biol Chem. 276, 45642-45653. Li, K, Smagula, CS, and Parsons, WJ (1994). Subcellular partitioning of MRP RNA assessed by ultrastructural and biochemical analysis. J Cell Biol. 124, 871-882. Martin, RP, Schneller, JM, Stahl, AJ, and Dirheimer, G (1977). Study of yeast mitochondrial tRNAs by two-dimensional polyacrylamide gel electrophoresis: characterization of isoaccepting species and search for imported cytoplasmic tRNAs. Nucleic Acids Res. 4, 3497-3510. Simpson, AM, Suyama, Y, Dewes, H, Campbell, DA, and Simpson, L (1989). Kinetoplastid mitochondria contain functional tRNAs which are encoded in nuclear DNA and also contain small minicircle and maxicircle transcripts of unknown function. Nucleic Acids Res. 17, 5427-5445. Hancock, K, and Hajduk, SL (1990). The mitochondrial tRNAs of Trypanosoma brucei are nuclear encoded. J Biol Chem. 265, 19208-19215. Mottram, JC, Bell, SD, Nelson, RG, and Barry, JD (1991). tRNAs of Trypanosoma brucei. Unusual gene organization and mitochondrial importation. J Biol Chem. 266, 18313-18317. Lye, LF, Chen, DH, and Suyama, Y (1993). Selective import of nuclear-encoded tRNAs into mitochondria of the protozoan Leishmania tarentolae. Mol Biochem Parasitol. 58, 233-245. Schneider, A, Martin, J, and Agabian, N (1994). A nuclear encoded tRNA of Trypanosoma brucei is imported into mitochondria. Mol Cell Biol. 14, 2317-2322. Rusconi, CP, and Cech, TR (1996). Mitochondrial import of only one of three nuclear-encoded glutamine tRNAs in Tetrahymena thermophila. EMBO J. 15, 3286-3295. Martin, RP, Schneller, JM, Stahl, AJ, and Dirheimer, G (1979). Import of nuclear deoxyribonucleic acid coded lysine-accepting transfer ribonucleic acid (anticodon C-U-U) into yeast mitochondria. Biochemistry. 18, 4600-4605. Tarassov, IA, and Martin, RP (1996). Mechanisms of tRNA import into yeast mitochondria: an overview. Biochimie. 78, 502-510. Marechal-Drouard, L, Weil, JH, and Guillemaut, P (1988). Import of several tRNAs from the cytoplasm into the mitochondria in bean Phaseolus vulgaris. Nucleic Acids Res. 16, 4777-4788. Dietrich, A, Small, I, Cosset, A, Weil, JH, and Marechal-Drouard, L (1996). Editing and import: strategies for providing plant mitochondria with a complete set of functional transfer RNAs. Biochimie. 78, 518-529. Akashi, K, Sakurai, K, Hirayama, J, Fukuzawa, H, and Ohyama, K (1996). Occurrence of nuclear-encoded tRNAIle in mitochondria of the liverwort Marchantia polymorpha. Curr Genet. 30, 181-185. Chen, HC, Viry-Moussaid, M, Dietrich, A, and Wintz, H (1997). Evolution of a mitochondrial tRNA PHE gene in A. thaliana: import of cytosolic tRNA PHE into mitochondria. Biochem Biophys Res Commun. 237, 432-437. Glover, KE, Spencer, DF, and Gray, MW (2001). Identification and structural characterization of nucleus-encoded transfer RNAs imported into wheat mitochondria. J Biol Chem. 276, 639-648. Brubacher-Kauffmann, S, Marechal-Drouard, L, Cosset, A, Dietrich, A, and Duchene, AM (1999). Differential import of nuclear-encoded tRNAGly isoacceptors into solanum Tuberosum mitochondria. Nucleic Acids Res. 27, 2037-2042. Dorner, M, Altmann, M, Paabo, S, and Morl, M (2001). Evidence for import of a lysyl-tRNA into marsupial mitochondria. Mol Biol Cell. 12, 2688-2698. Schneider, A (2011). Mitochondrial tRNA import and its consequences for mitochondrial translation. Annu Rev Biochem. 80, 1033-1053. Tarassov, I, Kamenski, P, and Kolesnikova, O (2007). Import of nuclear DNA-encoded RNAs into mitochondria and mitochondrial translation. Cell Cycle. 6, 2473-2477. Kolesnikova, OA, Entelis, NS, and Jacquin-Becker, C (2004). Nuclear DNA-encoded tRNAs targeted into mitochondria can rescue a mitochondrial DNA mutation associated with the MERRF syndrome in cultured human cells. Hum Mol Genet. 13, 2519-2534. Kolesnikova, OA, Entelis, NS, Mireau, H, Fox, TD, Martin, RP, and Tarassov, IA (2000). Suppression of mutations in mitochondrial DNA by tRNAs imported from the cytoplasm. Science. 289, 1931-1933. Tarassov, IA, and Entelis, NS (1992). Mitochondrially-imported cytoplasmic tRNA(Lys)(CUU) of Saccharomyces cerevisiae: in vivo and in vitro targetting systems. Nucleic Acids Res. 20, 1277-1281. Rubio, MA, Rinehart, JJ, and Krett, B (2008). Mammalian mitochondria have the innate ability to import tRNAs by a mechanism distinct from protein import. Proc Natl Acad Sci U S A. 105, 9186-9191. Brandina, I, Graham, J, and Lemaitre-Guillier, C (2006). Enolase takes part in a macromolecular complex associated to mitochondria in yeast. Biochim Biophys Acta. 1757, 1217-1228. Entelis, N, Brandina, I, Kamenski, P, Krasheninnikov, IA, Martin, RP, and Tarassov, I (2006). A glycolytic enzyme, enolase, is recruited as a cofactor of tRNA targeting toward mitochondria in Saccharomyces cerevisiae. Genes Dev. 20, 1609-1620. Kamenski, P, Smirnova, E, and Kolesnikova, O (2010). tRNA mitochondrial import in yeast: Mapping of the import determinants in the carrier protein, the precursor of mitochondrial lysyl-tRNA synthetase. Mitochondrion. 10, 284-293. Tarassov, I, Entelis, N, and Martin, RP (1995). Mitochondrial import of a cytoplasmic lysine-tRNA in yeast is mediated by cooperation of cytoplasmic and mitochondrial lysyl-tRNA synthetases. EMBO J. 14, 3461-3471. Tarassov, I, Entelis, N, and Martin, RP (1995). An intact protein translocating machinery is required for mitochondrial import of a yeast cytoplasmic tRNA. J Mol Biol. 245, 315-323. Kolesnikova, O, Kazakova, H, and Comte, C (2010). Selection of RNA aptamers imported into yeast and human mitochondria. RNA. 16, 926-941. Gowher, A, Smirnov, A, Tarassov, I, and Entelis, N (2013). Induced tRNA import into human mitochondria: implication of a host aminoacyl-tRNA-synthetase. PLoS One. 8, e66228. Eilers, M, and Schatz, G (1986). Binding of a specific ligand inhibits import of a purified precursor protein into mitochondria. Nature. 322, 228-232. Entelis, NS, Kieffer, S, Kolesnikova, OA, Martin, RP, and Tarassov, IA (1998). Structural requirements of tRNALys for its import into yeast mitochondria. Proc Natl Acad Sci U S A. 95, 2838-2843. Vestweber, D, and Schatz, G (1989). DNA-protein conjugates can enter mitochondria via the protein import pathway. Nature. 338, 170-172. Nierlich, DP (1982). Fragmentary 5S rRNA gene in the human mitochondrial genome. Mol Cell Biol. 2, 207-209. Pelham, HR, and Brown, DD (1980). A specific transcription factor that can bind either the 5S RNA gene or 5S RNA. Proc Natl Acad Sci U S A. 77, 4170-4174. Guddat, U, Bakken, AH, and Pieler, T (1990). Protein-mediated nuclear export of RNA: 5S rRNA containing small RNPs in xenopus oocytes. Cell. 60, 619-628. Chan, YL, Lin, A, McNally, J, and Wool, IG (1987). The primary structure of rat ribosomal protein L5. A comparison of the sequence of amino acids in the proteins that interact with 5 S rRNA. J Biol Chem. 262, 12879-12886. Steitz, JA, Berg, C, and Hendrick, JP (1988). A 5S rRNA/L5 complex is a precursor to ribosome assembly in mammalian cells. J Cell Biol. 106, 545-556. Rudt, F, and Pieler, T (1996). Cytoplasmic retention and nuclear import of 5S ribosomal RNA containing RNPs. EMBO J. 15, 1383-1391. Smirnov, A, Tarassov, I, and Mager-Heckel, AM (2008). Two distinct structural elements of 5S rRNA are needed for its import into human mitochondria. RNA. 14, 749-759. Smirnov, A, Comte, C, and Mager-Heckel, AM (2010). Mitochondrial enzyme rhodanese is essential for 5 S ribosomal RNA import into human mitochondria. J Biol Chem. 285, 30792-30803. Ridanpaa, M, van Eenennaam, H, and Pelin, K (2001). Mutations in the RNA component of RNase MRP cause a pleiotropic human disease, cartilage-hair hypoplasia. Cell. 104, 195-203. Hermanns, P, Bertuch, AA, and Bertin, TK (2005). Consequences of mutations in the non-coding RMRP RNA in cartilage-hair hypoplasia. Hum Mol Genet. 14, 3723-3740. Chu, S, Archer, RH, Zengel, JM, and Lindahl, L (1994). The RNA of RNase MRP is required for normal processing of ribosomal RNA. Proc Natl Acad Sci U S A. 91, 659-663. Schmitt, ME, and Clayton, DA (1993). Nuclear RNase MRP is required for correct processing of pre-5.8S rRNA in Saccharomyces cerevisiae. Mol Cell Biol. 13, 7935-7941. Gill, T, Cai, T, Aulds, J, Wierzbicki, S, and Schmitt, ME (2004). RNase MRP cleaves the CLB2 mRNA to promote cell cycle progression: novel method of mRNA degradation. Mol Cell Biol. 24, 945-953. Maida, Y, Yasukawa, M, and Furuuchi, M (2009). An RNA-dependent RNA polymerase formed by TERT and the RMRP RNA. Nature. 461, 230-235. Chen, HW, Rainey, RN, and Balatoni, CE (2006). Mammalian polynucleotide phosphorylase is an inter-membrane space RNase that maintains mitochondrial homeostasis. Mol Cell Biol. 26, 8475-8487. Chen, HW, Koehler, CM, and Teitell, MA (2007). Human polynucleotide phosphorylase: location matters. Trends Cell Biol. 17, 600-608. Rainey, RN, Glavin, JD, Chen, HW, French, SW, Teitell, MA, and Koehler, CM (2006). A new function in translocation for the mitochondrial i-AAA protease Yme1: import of polynucleotide phosphorylase into the inter-membrane space. Mol Cell Biol. 26, 8488-8497. Guerrier-Takada, C, Gardiner, K, Marsh, T, Pace, N, and Altman, S (1983). The RNA moiety of ribonuclease P is the catalytic subunit of the enzyme. Cell. 35, 849-857. Pannucci, JA, Haas, ES, Hall, TA, Harris, JK, and Brown, JW (1999). RNase P RNAs from some Archaea are catalytically active. Proc Natl Acad Sci U S A. 96, 7803-7808. Kikovska, E, Svard, SG, and Kirsebom, LA (2007). Eukaryotic RNase P RNA mediates cleavage in the absence of protein. Proc Natl Acad Sci U S A. 104, 2062-2067. Doersen, CJ, Guerrier-Takada, C, Altman, S, and Attardi, G (1985). Characterization of an RNase P activity from HeLa cell mitochondria. Comparison with the cytosol RNase P activity. J Biol Chem. 260, 5942-5949. Rossmanith, W, and Karwan, RM (1998). Characterization of human mitochondrial RNase P: novel aspects in tRNA processing. Biochem Biophys Res Commun. 247, 234-241. Bartkiewicz, M, Gold, H, and Altman, S (1989). Identification and characterization of an RNA molecule that copurifies with RNase P activity from HeLa cells. Genes Dev. 3, 488-499. Huntzinger, E, and Izaurralde, E (2011). Gene silencing by microRNAs: contributions of translational repression and mRNA decay. Nat Rev Genet. 12, 99-110. Filipowicz, W, Bhattacharyya, SN, and Sonenberg, N (2008). Mechanisms of post-transcriptional regulation by microRNAs: are the answers in sight?. Nat Rev Genet. 9, 102-114. Bartel, DP (2009). MicroRNAs: target recognition and regulatory functions. Cell. 136, 215-233. Kim, VN, Han, J, and Siomi, MC (2009). Biogenesis of small RNAs in animals. Nat Rev Mol Cell Biol. 10, 126-139. Newman, MA, and Hammond, SM (2010). Emerging paradigms of regulated microRNA processing. Genes Dev. 24, 1086-1092. Kloosterman, WP, and Plasterk, RH (2006). The diverse functions of microRNAs in animal development and disease. Dev Cell. 11, 441-450. Catalanotto, C, Cogoni, C, and Zardo, G (2016). MicroRNA in Control of Gene Expression: An Overview of Nuclear Functions. Int J Mol Sci. 17. Yao, S (2016). MicroRNA biogenesis and their functions in regulating stem cell potency and differentiation. Biol Proced Online. 18, 8. Bushati, N, and Cohen, SM (2007). microRNA functions. Annu Rev Cell Dev Biol. 23, 175-205. Abdelmohsen, K, and Gorospe, M (2015). Noncoding RNA control of cellular senescence. Wiley Interdiscip Rev RNA. 6, 615-629. Rottiers, V, and Naar, AM (2012). MicroRNAs in metabolism and metabolic disorders. Nat Rev Mol Cell Biol. 13, 239-250. Shah, MY, Ferrajoli, A, Sood, AK, Lopez-Berestein, G, and Calin, GA (2016). microRNA Therapeutics in Cancer - An Emerging Concept. EBioMedicine. 12, 34-42. Saeidimehr, S, Ebrahimi, A, Saki, N, Goodarzi, P, and Rahim, F (2016). MicroRNA-Based Linkage between Aging and Cancer: from Epigenetics View Point. Cell J. 18, 117-126. Das, S, Ferlito, M, and Kent, OA (2012). Nuclear miRNA regulates the mitochondrial genome in the heart. Circ Res. 110, 1596-1603. Sripada, L, Tomar, D, and Singh, R (2012). Mitochondria: one of the destinations of miRNAs. Mitochondrion. 12, 593-599. Bienertova-Vasku, J, Sana, J, and Slaby, O (2013). The role of microRNAs in mitochondria in cancer. Cancer Lett. 336, 1-7. Barrey, E, Saint-Auret, G, Bonnamy, B, Damas, D, Boyer, O, and Gidrol, X (2011). Pre-microRNA and mature microRNA in human mitochondria. PLoS One. 6, e20220. Srinivasan, H, and Das, S (2015). Mitochondrial miRNA (MitomiR): a new player in cardiovascular health. Can J Physiol Pharmacol. 93, 855-861. Zhang, X, Zuo, X, and Yang, B (2014). MicroRNA directly enhances mitochondrial translation during muscle differentiation. Cell. 158, 607-619. Bandiera, S, Mategot, R, Girard, M, Demongeot, J, and Henrion-Caude, A (2013). MitomiRs delineating the intracellular localization of microRNAs at mitochondria. Free Radic Biol Med. 64, 12-19. Duarte, FV, Palmeira, CM, and Rolo, AP (2014). The Role of microRNAs in Mitochondria: Small Players Acting Wide. Genes (Basel). 5, 865-886. Das, S, Bedja, D, and Campbell, N (2014). miR-181c regulates the mitochondrial genome, bioenergetics, and propensity for heart failure in vivo. PLoS One. 9, e96820. Dasgupta, N, Peng, Y, Tan, Z, Ciraolo, G, Wang, D, and Li, R (2015). miRNAs in mtDNA-less cell mitochondria. Cell Death Discov. 1, 15004. Bukeirat, M, Sarkar, SN, Hu, H, Quintana, DD, Simpkins, JW, and Ren, X (2016). MiR-34a regulates blood-brain barrier permeability and mitochondrial function by targeting cytochrome c. J Cereb Blood Flow Metab. 36, 387-392. Jagannathan, R, Thapa, D, and Nichols, CE (2015). Translational Regulation of the Mitochondrial Genome Following Redistribution of Mitochondrial MicroRNA in the Diabetic Heart. Circ Cardiovasc Genet. 8, 785-802. Guttman, M, and Rinn, JL (2012). Modular regulatory principles of large non-coding RNAs. Nature. 482, 339-346. Kretz, M, Siprashvili, Z, and Chu, C (2013). Control of somatic tissue differentiation by the long non-coding RNA TINCR. Nature. 493, 231-235. Guttman, M, Amit, I, and Garber, M (2009). Chromatin signature reveals over a thousand highly conserved large non-coding RNAs in mammals. Nature. 458, 223-227. Khalil, AM, Guttman, M, and Huarte, M (2009). Many human large intergenic noncoding RNAs associate with chromatin-modifying complexes and affect gene expression. Proc Natl Acad Sci U S A. 106, 11667-11672. Rinn, JL, Kertesz, M, and Wang, JK (2007). Functional demarcation of active and silent chromatin domains in human HOX loci by noncoding RNAs. Cell. 129, 1311-1323. Mattick, JS, and Makunin, IV (2006). Non-coding RNA. Hum Mol Genet. 15, R17-29. Carpenter, S, Aiello, D, and Atianand, MK (2013). A long noncoding RNA mediates both activation and repression of immune response genes. Science. 341, 789-792. Huarte, M, Guttman, M, and Feldser, D (2010). A large intergenic noncoding RNA induced by p53 mediates global gene repression in the p53 response. Cell. 142, 409-419. Salinas, T, Duchene, AM, and Delage, L (2006). The voltage-dependent anion channel, a major component of the tRNA import machinery in plant mitochondria. Proc Natl Acad Sci U S A. 103, 18362-18367. O’Brien, TW (1971). The general occurrence of 55 S ribosomes in mammalian liver mitochondria. J Biol Chem. 246, 3409-3417. Grivell, LA, Reijnders, L, and Borst, P (1971). Isolation of yeast mitochondrial ribosomes highly active in protein synthesis. Biochim Biophys Acta. 247, 91-103. Sharma, MR, Booth, TM, Simpson, L, Maslov, DA, and Agrawal, RK (2009). Structure of a mitochondrial ribosome with minimal RNA. Proc Natl Acad Sci U S A. 106, 9637-9642. Sharma, MR, Koc, EC, Datta, PP, Booth, TM, Spremulli, LL, and Agrawal, RK (2003). Structure of the mammalian mitochondrial ribosome reveals an expanded functional role for its component proteins. Cell. 115, 97-108. Smits, P, Smeitink, JA, van den Heuvel, LP, Huynen, MA, and Ettema, TJ (2007). Reconstructing the evolution of the mitochondrial ribosomal proteome. Nucleic Acids Res. 35, 4686-4703. Mears, JA, Sharma, MR, and Gutell, RR (2006). A structural model for the large subunit of the mammalian mitochondrial ribosome. J Mol Biol. 358, 193-212. Agrawal, RK, and Sharma, MR (2012). Structural aspects of mitochondrial translational apparatus. Curr Opin Struct Biol. 22, 797-803. Cha, MY, Han, SH, and Son, SM (2012). Mitochondria-specific accumulation of amyloid beta induces mitochondrial dysfunction leading to apoptotic cell death. PLoS One. 7, e34929. Reddy, PH (2009). Amyloid beta, mitochondrial structural and functional dynamics in Alzheimer’s disease. Exp Neurol. 218, 286-292. Canugovi, C, Shamanna, RA, Croteau, DL, and Bohr, VA (2014). Base excision DNA repair levels in mitochondrial lysates of Alzheimer’s disease. Neurobiol Aging. 35, 1293-1300. Marongiu, R, Spencer, B, and Crews, L (2009). Mutant Pink1 induces mitochondrial dysfunction in a neuronal cell model of Parkinson’s disease by disturbing calcium flux. J Neurochem. 108, 1561-1574. Mortiboys, H, Thomas, KJ, and Koopman, WJ (2008). Mitochondrial function and morphology are impaired in parkin-mutant fibroblasts. Ann Neurol. 64, 555-565. Canet-Aviles, RM, Wilson, MA, and Miller, DW (2004). The Parkinson’s disease protein DJ-1 is neuroprotective due to cysteine-sulfinic acid-driven mitochondrial localization. Proc Natl Acad Sci U S A. 101, 9103-9108. Devi, L, Raghavendran, V, Prabhu, BM, Avadhani, NG, and Anandatheerthavarada, HK (2008). Mitochondrial import and accumulation of alpha-synuclein impair complex I in human dopaminergic neuronal cultures and Parkinson disease brain. J Biol Chem. 283, 9089-9100. Ide, T, Tsutsui, H, and Hayashidani, S (2001). Mitochondrial DNA damage and dysfunction associated with oxidative stress in failing hearts after myocardial infarction. Circ Res. 88, 529-535. Ballinger, SW, Patterson, C, and Knight-Lozano, CA (2002). Mitochondrial integrity and function in athero-genesis. Circulation. 106, 544-549. Romanello, V, Guadagnin, E, and Gomes, L (2010). Mitochondrial fission and remodelling contributes to muscle atrophy. EMBO J. 29, 1774-1785. Crescenzo, R, Bianco, F, Mazzoli, A, Giacco, A, Liverini, G, and Iossa, S (2014). Mitochondrial efficiency and insulin resistance. Front Physiol. 5, 512. Mathur, S, Brooks, D, and Carvalho, CR (2014). Structural alterations of skeletal muscle in copd. Front Physiol. 5, 104. Antunes, F, Corazzari, M, Pereira, G, Fimia, GM, Piacentini, M, and Smaili, S (2016). Fasting boosts sensitivity of human skin melanoma to cisplatin-induced cell death. Biochem Biophys Res Commun. Katsetos, CD, Anni, H, and Draber, P (2013). Mitochondrial dysfunction in gliomas. Semin Pediatr Neurol. 20, 216-227. Trifunovic, A, Wredenberg, A, and Falkenberg, M (2004). Premature ageing in mice expressing defective mitochondrial DNA polymerase. Nature. 429, 417-423. Sastre, J, Pallardo, FV, Garcia de la Asuncion, J, and Vina, J (2000). Mitochondria, oxidative stress and aging. Free Radic Res. 32, 189-198. Smirnov, AV, Entelis, NS, Krasheninnikov, IA, Martin, R, and Tarassov, IA (2008). Specific features of 5S rRNA structure - its interactions with macromolecules and possible functions. Biochemistry (Mosc). 73, 1418-1437. Tonin, Y, Heckel, AM, and Vysokikh, M (2014). Modeling of antigenomic therapy of mitochondrial diseases by mitochondrially addressed RNA targeting a pathogenic point mutation in mitochondrial DNA. J Biol Chem. 289, 13323-13334.